It’s supposed to be a fair way to decide who does national service and who doesn’t, but Mum reckons it isn’t. She says the fate of a mother’s son shouldn’t depend on a number picked out of a barrel. The marbles that go in the barrel have the days of the month on them. An agreed number of marbles are drawn out of the barrel, and if your birth date is on one, you’re ‘balloted in’. It’s 1969 and Davey’s big brother Tom has been conscripted. Chosen because of his birthdate, he has no choice but to report for service. Soon, Tom is in Vietnam and his family are back home worrying about him. But there are other things happening in Davey’s life, too. He and his two best mates love surfing, and are determined to win the inaugural Newcastle Under-14 Championship. Thye are fascinated, too, by the planned moon landing, and follow preparations keenly. But growing up isn’t always fun, and Davey and his mates have some hard lessons to learn. 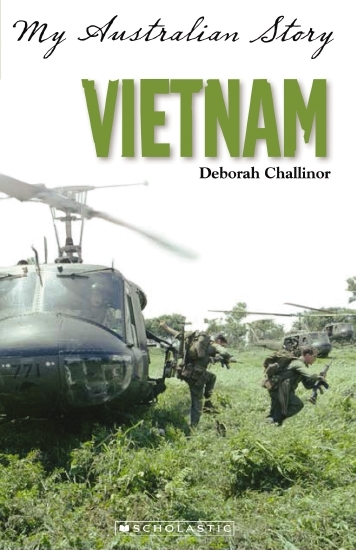 Vietnam , part of the My Australian Story series, is a wonderful diary format story giving an insight into Australia’s involvement in the Vietnam War through the experiences of one family. It also offers a snapshot of late 1960s life, including the music of the time, key events in the year, the union movement, the impact of war on generations of Australians and more. An excellent offering for primary aged readers.